Plans have been uncovered to stage an illegal "silent rave" in Glasgow's Central Station at the weekend. British Transport Police (BTP) said it had become aware of people using social networking sites in an attempt to attract a large crowd on Saturday. Officers and staff from Network Rail will be deployed over the weekend to prevent overcrowding. 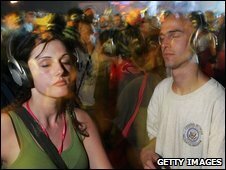 A "silent rave" involves people meeting to dance to music played into their headphones from portable music players. BTP said precautions would still be taken even though references to the event had now been removed from internet sites. Ch Insp Dave Marshall, from BTP, said: "This does not appear to be a good idea. "We don't want to spoil people's fun but we do want to make sure the station can continue to operate and passengers and rail staff can travel and work as normal. "A large number of people in a confined space can cause safety concerns. We would encourage those who organise events like this to do so away from the rail network." David Simpson, Network Rail route director, added: "We will not allow a completely unauthorised event like this to disrupt passenger journeys and we urge any would be participants or curious bystanders to stay away from the station at this time."